I've finally completed my son's Monopoly quilt. I bought the fabric about a year and a half ago but I could not figure out how I wanted to piece it together. The teen and I thought about several different patterns but none of them felt right so finally, I just started cutting and piecing with 2 ideas: 1) have one Monopoly board in the middle of the quilt, and 2) showcase the other fabrics but still have them support the Monopoly board. I am thrilled with what I ended up with. The next step, quilting. Again I wanted to showcase the fabrics but still have quilting loose enough to keep warmth to the quilt but individualized designs in each of the different areas. I ended up quilting long wavy lines on the chance and pieces borders and in the black with cards/individual bills, I echo quilted around the cards and bills with a small wave in between each (it's really hard to see in this picture). Meandering with "money" written in is what's on the money borders. Smaller wavy diagonal lines on the board with a curved echo in the real estate spaces. 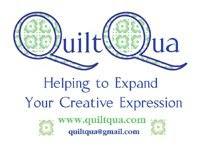 In the orange chance areas, I did square type quilting and in the polka dots, I quilted a loops. You should be able to see them better in the picture of the backing (which is a fun stripe in the colors of the quilt). Lastly, for the binding, I combined alternating directions of the backing stripe. It's a different look and adds a little character. Here is P. I told him to come outside and help me with the photo shoot. Nearing 6 ft already, I believe he thought he was simply going to be holding the quilt up (which he did) until I said, "now pose with it, because you are going up on the blog." He replied, "okay" and the photo below is the look on his face when he actually realized what I said and what he agreed to and then said, "wait, what?" I was prepared for that. Here he is (b/c I love him and you don't see much of him on my blog), deciding how to pose. Finally, my handsome boy headed too fast for manhood. I'm glad he still keeps some whimsy about him and is happy to have the quilt for his bed. I love you, P.
You did a great job with this quilt. The layout and fabrics are wonderful and your son looks very happy with it. What a cool quilt, and I'm glad he loves it! I'm making a quilt and I've decided to make the backing from Monopoly fabric pieces. I keep coming back to your blog post as a reference. Thanks for keeping it available.